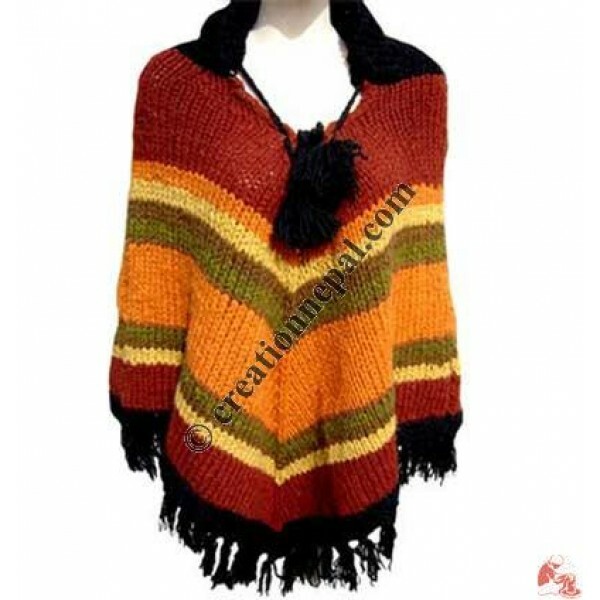 Colorful stripes design hand knitted woolen poncho with hood and frills. Nepalese woolen ponchos are beautiful women wear made by skillful knitters at home based business with fair trade norms. Nepal woolen winter fashion poncho available in different sizes as requested by the buyer. The given weight of the poncho is calculated for the shipping purpose due to its volume consuming nature, so that the actual weight can be different than it is mentioned here. Since the product is entirely handmade, there can be slight variation in each final product.